Sberbank now benchmarks its performance against technology companies not other banks. Despite massive market share, it sees plenty of threats and it is seeking to respond at speed and scale. Everything about Sberbank is big. It dominates its domestic Russian market, as reflected in a host of metrics, such as more than 110 million retail customers, 60 million visits per month to its 14,500 branches (which span eleven time-zones) and 13 million visits per day via its digital channels. 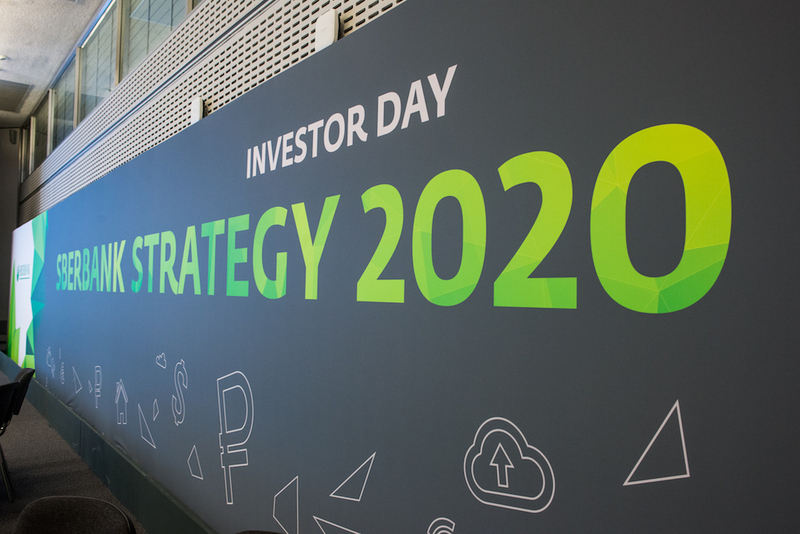 It also has massive resources (including 11,500 developers among its 311,000 employees) and, at its investor day in London at the end of last year at which it unveiled its Strategy 2020, it was promising 20.8% return on earnings for 2017, with a target of at least 50% dividends by 2020. In a market that is hard for non-domestic banks to penetrate and with, to date, no sign of any government plans to break its stranglehold, you’d think it might be sitting back and basking in a comfort-zone that most other banks can only dream about. In fact, it has major ambitions for technology and for building an ecosystem outside of its core banking activities. Its comfort-zone looks less cosy when evaluating the potential threat from technology companies and, indeed, the main stated goal of its Strategy 2020 is “to push Sberbank to the next level and ensure our ability to compete with global technology companies, while remaining the best bank for customers and businesses”. For all the talk of innovation, the bank still has at its heart a lot of legacy systems that it has been struggling to overhaul and replace. The attributes of its new core platform tick the right boxes – cloud-based, open source, a group-level common data source and in-memory computing – and it has a massive ongoing implementation of SAP ERP, having also implemented Wolters Kluwer’s Riskpro for risk management. Nevertheless, the core project is running late and most of the innovation that has happened to date has been around the edges. Despite the legacy and piecemeal core, its cost-to-income ratio has just edged below 40% with the ambitious target of having this below 30% by 2020. “Is there a single bank of our size at 30%?” asked CEO, Herman Gref, at the investor day. “Unless we have this, we won’t be around because I know society will not pay for our inefficiencies.” If there is an opportunity to buy a service cheaper, customers will always take it, he said. Gref has identified three stages in the bank’s evolution. Ten years ago, “a different life”, it had long queues, no automation and customer service was from behind bullet-proof windows. From here, it set about becoming leaner without impacting customer value and seeking to remove barriers, both physical but also those “in people’s minds”. The second phase saw technology applied to serve customers but Gref admits it wasn’t a straightforward story, with much outsourcing to vendors and often long delays. However, in parallel it started to lay the foundations to break down the walls between the business and technology and move to an in-house development model. This has paved the way for the current third phase. It is seeking radical change in four key areas, Gref says: the client relationship, the quality of its products, its channels (including social media) and efficiency. SberTech, which has housed the bank’s development resources since 2011, has 46 centres and has more than 550 active projects, with around 17,000 implementations per year. “We have less and less dependence on external vendors,” says the bank’s COO, Lev Khasis. 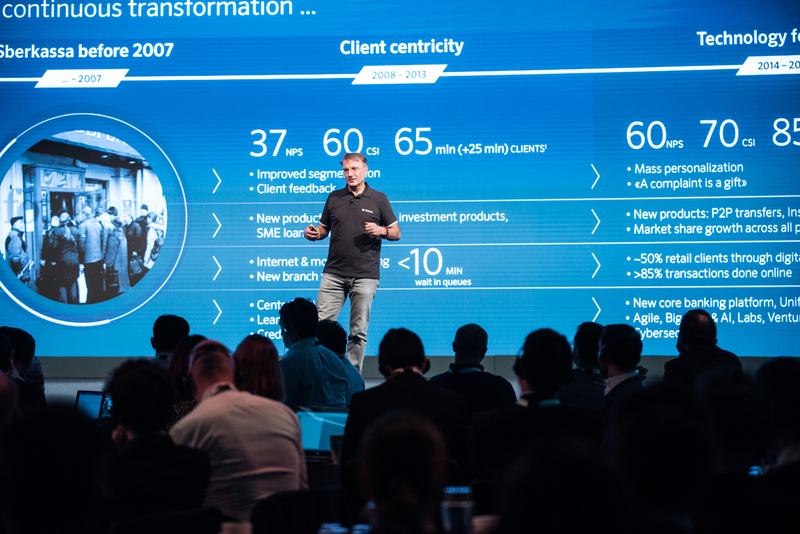 “We are creating a completely different time-to-market.” This includes adopting Agile on a massive scale, with 1300 teams and with all development staff due to have completed training by 2020. It is described as the “largest Agile transition project in banking”. Recruiting and retaining staff is a challenge. It works closely with Russian universities and also has its own internal academy. While its overall headcount declines, it will have more than doubled its number of IT, data and risk management staff between 2008 and 2020. In addition, all 35,000 Sberbank managers are going through IT and data training to acquire these skills. Also aiding the “cross-fertilisation”, every business unit now has at least one chief data scientist. The bank expects to apply artificial intelligence (AI) to recruitment, including shortlisting, and to staff management, moving to a single cloud-based HR platform. Its IT budget as a proportion of overall costs is expected to be 15% by 2020, compared with 12% at present, with overall bank-wide staff costs falling from 59% to 55% in the same period. So for all the rhetoric, how far has it come? It admits that the overhaul of the core, which started in 2014, has proved to be harder than expected. Gref describes it as a “gigantic evolution” that the bank couldn’t truly comprehend at the outset. 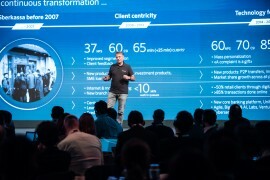 He admits there is also still work to do in terms of its speed and agility to develop and deliver new products. The revised timetable for the core, according to Khasis, is now for all coding and hardware to be in place during 2018, followed by test migrations in 2019 and full-scale launch in 2020. This will facilitate on-going efforts to reduce its back office. Where it had 58,000 back office staff in 2008, it now claims 10,000 across seven centres, with the aim of fewer than 6000 staff and a single shared service centre to coincide with the “complete departure” from the legacy systems. For digitalisation, Gref claims “enormous steps at great speed” but admits to being a relative newcomer, so with work still to do. Similarly for data analytics, four years of effort have made it one of the leading entities in the Russian market, he claims, but this is also still work in progress. Overall improved productivity is, in Gref’s words, “a limitless journey”. Part of the bank’s response has been the build-up of an ecosystem to facilitate a rapid move into broader financial services, allowing the bank to diversify as others come for its traditional core business. “We want an attack strategy,” says Gref, moving the other way as new competitors come onto its turf. One area of focus has been real estate, with the launch in January 2017 of Domclick.ru, which is meant to support all aspects of buying or renting a property, including associated documents, electronic registration and insurance, through to renovation and furniture. It claims a share of new mortgages of more than ten per cent in its first year (50,000+). It bought into the healthcare sector, in the form of DocDoc, an app-based aggregator that links customers with 28,000 doctors and 1000+ clinics. It claims a 60% share of online health services in Russia. Sberbank also has more traditional subsidiaries for pensions, insurance, asset management and depository services. It also invested in biometrics specialist, VisionLabs, and a year or so back created its own cybersecurity company, branded as BI.Zone. The latter is providing commercial services so that only around ten per cent of its business is with the bank itself. It has gained accreditation from Swift and has an agreement with Interpol to share intelligence data. Khasis points out that the bank does not always need to be the provider of services. “Our role is to become the orchestrator of the ecosystem.” An example is a recently inked joint venture with Yandex, for e-commerce, with expectations that other partnerships will follow. It is known to have held talks with the Chinese mega-company, Alibaba, but with no tangible outcome to date – “sometimes two elephants find it difficult to dance a tango”, says Gref. Khasis sees a lot of potential for growth of e-commerce in Russia, as it only currently accounts for around 4% of commerce, versus over 20% in, for instance, China. The aim is to turn Yandex’s current shopping comparison site into a fully-fledged e-commerce platform. 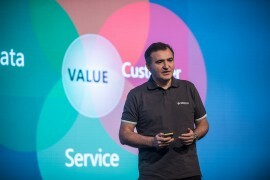 “Mass personalisation” is one rallying cry, moving from the traditional segmentation of customers by groups, typically based on the balance in their accounts, to much more nuanced analysis, that includes data about their habits, hobbies and social behaviour, and allowing real-time offers based on triggers. It claims to have made more than 500 million personal offers to clients in 2017, with this intended to be more than one billon by 2020. 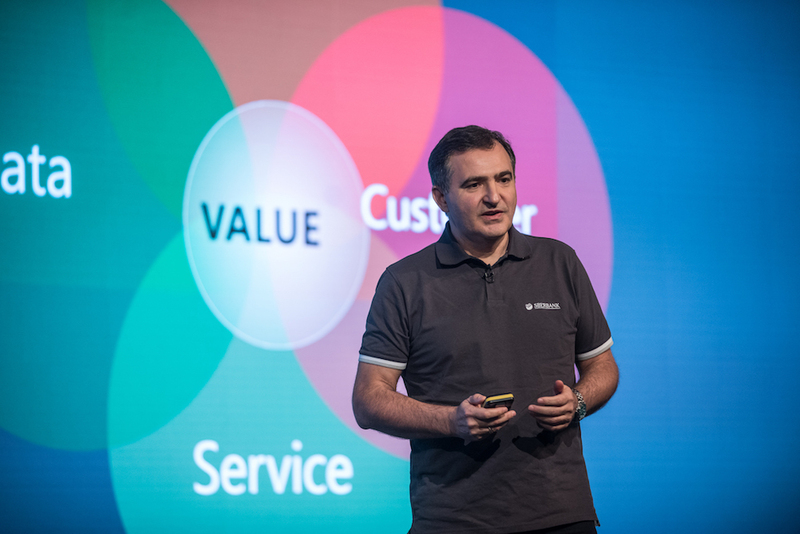 Poletaev describes the change as moving from financial profiles to social profiles, built up through customers’ interactions with the call centre, branch and channels as well as social media. By 2020, it wants to have “fully-filled profiles” of 95% of its customers and to have 90% of its sales consultations based on these. Often it has made the wrong offers, via the wrong channels to the wrong customers. Among new approaches, it is placing a lot of emphasis on targeted two-minute video campaigns. This is an excerpt. The full article is available in the February 2018 edition of the Banking Technology magazine. Click here to read it – the digital edition is free!